OK!Good Records has announced the digital release of an upcoming Donots album. The album will be available for digital purchase and streaming on Friday, March 4, 2016. Hailing from the small coal-mining town of Ibbenburen, Germany’s critically acclaimed punk rockers Donots are set to release their brand new album entitled ‘¡CARAJO!,’ via OK!Good Records on Friday, March 4th 2016. 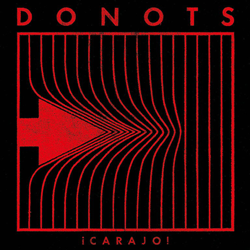 ‘¡CARAJO’ is the tenth studio album from Donots. The US release of ‘¡CARAJO,’ consists of fourteen tracks recorded in English. The album was previously recorded entirely German, marking the band’s first German language release. The German release received rave reviews throughout Europe, where it climbed to the Top 5 Charts marking the band’s highest chart position to date. The album has also led to largest sold out tour the band has played throughout their entire 22 year career. The album consists of sing-a-long punk anthems and uplifting bar brawl tracks, as well as melancholic wave pop tracks. The tenth album appeals to all Donots fans by capturing the past, present, and future sound of the veteran punk band. ‘¡CARAJO’ will be available digitally in North America on Friday, March 4, 2016. The album will be available for digital purchase on iTunes, Amazon, and Google Play. It will also be available for streaming on Spotify and Bandcamp.